Wood nymph, nature fairy, leaf girl…whatever you want to call it. 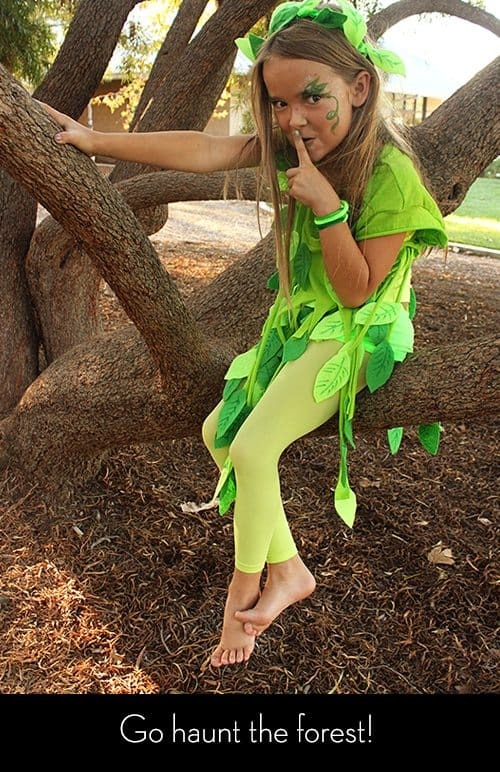 We’ve got the easiest Halloween costume for you if you’re looking something shredded and leafy. This idea would actually work well in other colors than green too. Fall fairy? Nature Princess? Scarecrow? Shredding an old t-shirt is quick and easy and looks great. 1. One old t-shirt. We found ours for a dollar at a thrift store. I think shredding t-shirts may be my new favorite hobby. We picked it up from the teenagers in our neighborhood who turn ordinary t-shirts into fashion statements on a regular basis. Cutting strips into a t-shirt is really easy to do. No sewing required! You can slice and dice a t-shirt a zillion ways. For this look we just cut from the bottom up. The t-shirt was too big for my daughter so we cut off the sleeves so it didn’t dwarf her but you could leave them on and shred them too. To make the leaves we cut the felt into roughly 2×3 inch rectangles and then rounded the edges until they were leaf shape. Then we used a permanent marker to draw on the veins. Next, we glued the leaves onto the t-shirt strands at various lengths with hot glue. Just be careful not to glue yourself or the strands from the back of the shirt! Easy does it! My daughter made herself a customized headband by wrapping chenille stems around it and then I hot-glued some leaves to the chenille stems. She also made herself a bracelet. Chenille stems really are the best crafting toy. You can make so many things with them. Then we added some face paint. She wore her green dance leotard underneath and we were good to go! Appropriate Age levels: Teen to adult for the t-shirt. 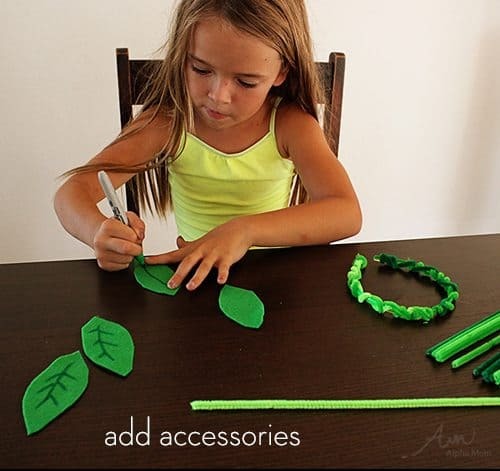 Five and up for making felt leaves and chenille stem accessories. *ALWAYS have a responsible adult on hand for the hot-gluing or cutting, especially with sharp scissors. *Never let a child use a hot glue gun. Hot glue can burn! Excellent!! I’m going to show this to my daughter for my granddaughter. So cute! So creative! I love how she got involved making it! Looks so easy! Thanks for sharing. 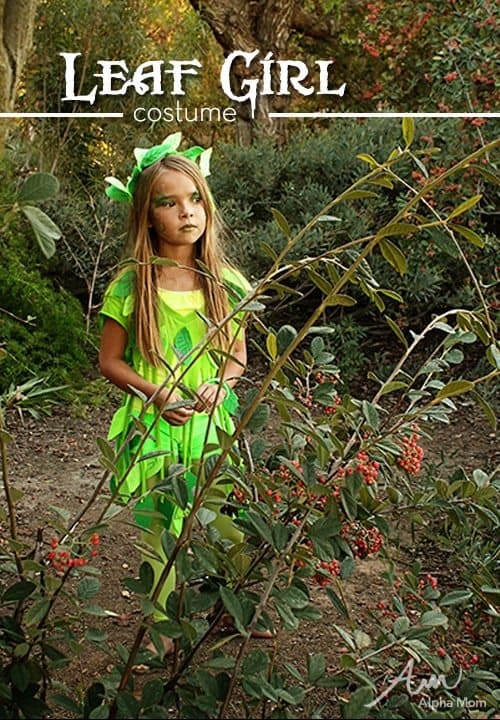 This is one great DIY costumes that I would like to try.. Thanks for sharing.